Like most kids in the U.S. Angela carries a backpack to school. A couple weeks ago I had to drop her off after an appointment. This meant taking her down to her Special Ed. classroom (which was empty) getting her hearing aids on and her FM system hooked up, then finding where she was supposed to be. Although there wasn't anything in Angela's backpack that she needed, she still insisted upon carrying it with her. This was clearly her routine so I didn't say anything. It was a looooooong, winding walk to the other end of the school. I wasn't sure I'd be able to find my way back to the front doors! I had a hard time keeping up to Angela who was clearly on a mission go get there quickly. Watching Angela lean into her backpack it occurred to me she wears it more for sensory input than because she needs anything in there. She likes deep pressure and "heavy" work. Some days she crams a lot of stuff in it: phy ed clothes, hockey helmet, water bottle, etc. In the summertime she often gets puts a ton of stuff in a backpack and goes "exploring" around the yard. She has nicely taught Axel how to put all this random crap in backpacks then later dump it out all over the bedroom put it away. It had already been a rough morning; her obsessing over the fact the collar of her shirt got wet when we were doing her hair, me telling her to stop obsessing, which of course makes her obsess more. This evolved into her refusing to leave the bathroom mirror which was about to cause her to miss the bus. "If you miss your bus you will NOT be watching any of your shows after school and I am not EVEN going to give in on that one later on!" She gave a big growl. After realizing the world would end if she didn't watch her shows, she finally conceded with, "I need a new shirt." I haven't yet checked, but based on historical evidence, I'm sure she ripped apart her closet to find just the right shirt. She raced back up the stairs and got her jacket and shoes on. As she slung that backpack on I wanted to know what she had in there that was so heavy. I pulled out two sets of phy. ed. clothes, two planners and a folder. I reached further down and found a water bottle that hadn't been properly closed because it was quite damp in there. That's when I realized the bottoms of the folders and planners I'd pulled out were covered in it. After yesterdays vomiting episodes with Asher I was still pretty gaggy myself. OMG...this was nasty. "Oh my God what do you HAVE in here???????" Apparently when Angela is done with lunch she's been putting her left over fruit in her backpack. There was now both a LIQUID banana and a slimy apple at the bottom of her back. I still can't figure out why it didn't smell. A mystery that will probably never be solved. I did what any good mother would do and threw the entire backpack and it's contents into the trash. Well, I did save her Lands End mittens because they're awesome, but everything else went out. 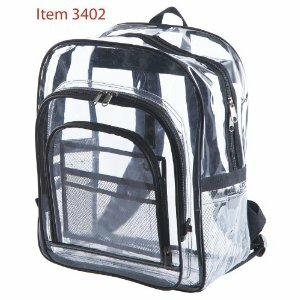 Years ago Angela had a clear backpack. I loved that thing because I could always see she's brought something home for me. I think it's time to go back! Ohhhh...gross... Love the idea of the clear backpack though!! That was nasty! I would have had a coronary--I can't stand touching something like that and being surprised. I think the clear backpack is the way to go for her! That reminded me of a time I found a ziploc baggie in the bottom of my daughter's backpack, filled with slimy green 'water'. We still don't know if the green liquid USED to be green grapes, or cucumber slices! Why aren't kids grossed out by these things??! Loooove the clear backpack btw! And the sickies hit AGAIN!